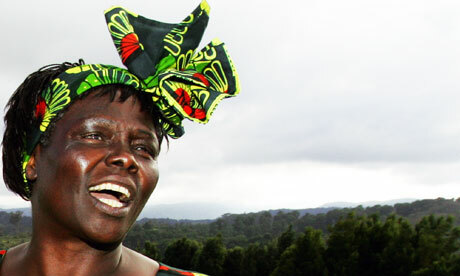 Tireless, awesome, determined, visionary, gift to the whole world–Wangari Maathai is leaving us way too soon. A beautiful article in The Guardian by Joseph Kabiru pays loving tribute to Maathai who passed away this weekend at 71. She could see the impact of rural communities on the overall ecosystem of East Africa and began her work in 1977. She lived to see the devastation caused by unsustainable farming practices be addressed and changed; she received wide recognition including the Nobel Peace Prize for her tireless efforts and vision; she lives on as an inspiration to so many. Amidst the silly, short term, wildly selfish me-first bottom line nonsense that fills the “news” and defines much of our conversation, the work of one woman who could see a path to sanity stands as a benchmark of our times. May her spirit live on and keep an eye on things for just a little longer.